The 2018 Toyota Camry XSE Review: When Toyota started its top-to-bottom redesign of America’s most popular car, the Camry, the goal could be summed up with one word: emotion. That’s a dramatic change for a vehicle long known for being automotive vanilla. Its decades-long reputation is built on reliability and practicality more than style and feel, so the decision to inject some excitement into the Camry, even a little bit, is a big deal. Toyota wants people to see this new-generation Camry as a break from the past, and its working. I just spent a week driving the all-new 2018 model, and people’s reaction was almost universally the same everywhere I took it. “That’s a Camry?” folks would ask. It certainly doesn’t look like your father’s Toyota. An aggressive front end with a gaping grille, sweeping character lines on the sides and an optional two-tone paint job with a blacked-out roof combine to make it look futuristic and even a bit, yes, sporty. Granted, my tester was the most out-there looking version, the Camry XSE, which was intentionally designed to appear different from the regular Camry from as far as 200 feet away. Toyota’s stylists wanted the sport trim levels, perhaps the Camry’s biggest opportunity for sales growth, to be obviously, blatantly special. Its new driving feel is similarly sporty, although no one will confuse it for a BMW. The version I tested felt more taut than any Camry I’ve driven before, with less body roll and a noticeably lower center of gravity that helps it hug the road. The vast majority of buyers, though, will be looking for what this car is known for: a smooth, silent, solid-feeling ride. 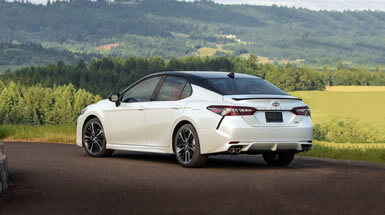 Toyota borrowed ideas from its luxury models to help make the new Camry quieter, including more sound insulation under the hood and in the fenders, a thicker insulating mat in front of the firewall, more noise-proofing material in the ceiling and a new design for the rain gutters to cut down on wind noise. While its roof height is an inch lower than before, something that helps its aerodynamics and contributes to that sporty new look, the interior feels just as spacious as ever. The hip points in both the front and back seats, hood height and glass area all dropped down about an inch, too, to keep visibility and roominess similar to the previous generation. This car’s Achilles heel remains its infotainment system. Most new 2018 vehicles are offering today’s two best smartphone connection technologies that come from actual tech companies, not car manufacturers, Apple CarPlay and Android Auto, but Toyota stubbornly continues to do its own thing and not offer the Apple or Google systems. Aside from that, it’s hard to find many complaints in this car. It’s an all-around solid product, as usual for a Camry. Just as before, three engine choices are available: four cylinders, six cylinders or a hybrid drivetrain. The 2.5-liter four-cylinder engine makes 206 horsepower and is rated for 41 mpg on the highway, a strong combination that will make most drivers happy. A 3.5-liter V6 is better for people who want more performance, and I loved how it felt and sounded in my tester. It makes 301 horsepower and earns a still-respectable 32-mpg highway rating from the government. The hybrid version is rated for 51 mpg in city driving and 53 on the highway, a huge jump over the previous generation car. Finally, there’s my favorite thing of all about the new Camry and what I think will move more of them on the showroom floor than anything else. It comes standard, even the cheapest base model, with radar cruise control, lane departure alert with steering assist, blind spot monitors, rear cross traffic alert and sensors designed to prevent collisions, including sensing pedestrians who walk in front of the car. The system is called Toyota Safety Sense-P, and Toyota deserves major kudos for making this a no-charge feature set on every model instead of an extra-cost upsell like most of its competitors. Pricing starts at $23,495 for the base L trim and ranges up to $34,950 for the sporty and luxurious XSE with a V6 engine. Why buy it? A total redesign makes the Toyota Camry more eye-catching and engaging to drive than before, especially on its sporty trim levels. It’s an overall improvement to America’s best-selling car for the past 15 years. The Bottom Line: The Toyota Camry is completely redesigned for 2018. 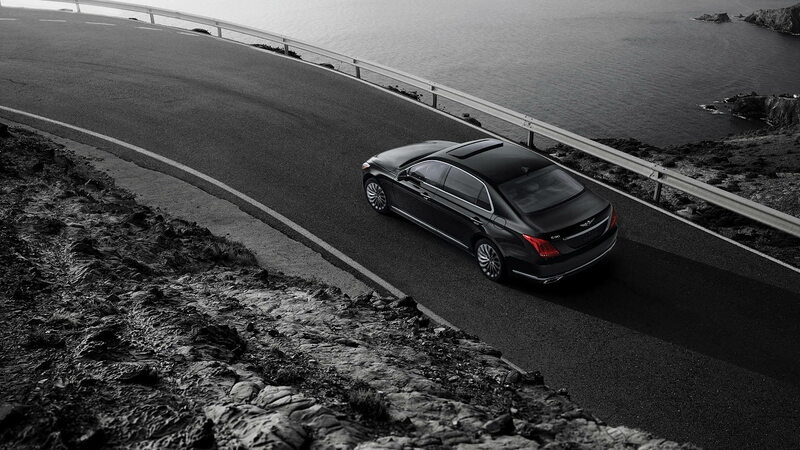 This top-selling model is more engaging to look at and a joy to drive everyday. The Camry’s new look marks a dramatic departure from the past, especially on the XSE sport trim, with a black roof and aggressive lines. Despite being an inch lower than before the new-generation Camry has a cabin that feels just as spacious, and it’s designed to look more engaging inside and out. And now it has, as standard equipment on all Camry’s, radar cruise control, lane departure alert with steering assist, blind spot monitors, rear cross traffic alert and sensors designed to prevent collisions, including sensing pedestrians who walk in front of the car.